★Tired of smudging and prints all over the shiny glass of your tablet's display? Looking for something a little more realistic than your finger for writing, drawing or painting? Gouler 2 in 1 active stylus match your iPad or other capacitive touchscreen device. The stylus has two different nib provide you different experience of use. It's quite smooth on glass but won't slippery. If you would like to jotting notes, drawing or using a stylus for greater accuracy , copper point tip delivered and fewer of smudgy fingerprints. No replace is required. It looks like some sort of wire mesh and it has a nice amount of friction and bounciness when used on screen. The wire mesh tip is more comfortable for use for tapping, scrolling and playing games, it won't scratch the screen. There is a rubber grip area and a heavy duty polished stainless steel pocket clip, it's well constructed and feels comfortable and well balanced in your hand. Except these, the USB charge port is protected by the mesh tip cap, prevent the dust plug the port to affect the charging. -Please do not drop the stylus on the floor/ ground, It may cause damaged. -Please do not place the stylus in high temperature. -Please do not attempt to disassemble the stylus. -Please switch off the power when charging for not affecting the charging time. -Please keep the nib away from water and oil, or it will affect product function. ★【High-precision Requirement】The iPad stylus is a durable and high-quality capacitive stylus which can offer accurate writing and sketching experience to you. A clip prevent the stylus losing or rolling off the desk, the rubber grip area make it easy to control. 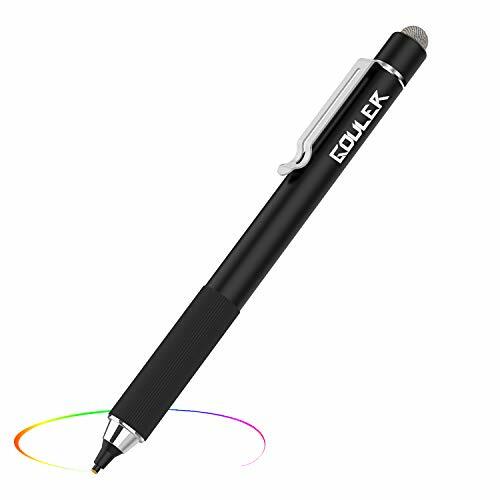 You will enjoy an experience closer to that like a real pencil use on paper by this stylus. ★【Widely Compatible】This stylus will work for iPhone6 / 6s / 7 / 8 Plus, iPhone X, iPad, iPad 2, iPad 4, iPad mini, iPad Air, iPad pro, Motorola, Samsung, and other Android devices. ★【Power-saving Function】The iPad pen charges fast and has a long battery life. It can supposed to provide up to 12 hours of continuous run time after fully charged. For power-saving, the stylus will power off automatically after 5 minutes of inactivity, it is really solve the problem that you forget to turn off the stylus. ★【Meet Different Needs】2 in 1 designed for different needs. Copper tip provide precise clicks, smooth use, just like real pen painting on paper; the mesh nib more comfortable for use for tapping and scrolling. Whichever nib you use, you are able to write consistently, without overlapping letters or inconsistent vertical spacing. ★【Package & Warranty】2 in 1 Active stylus*1, USB cable*1. We provide 7*24 online support standing by, RISK FREE 100% money-back guarantee, 1-Year Replacement Warranty and life-time technical support. If you have any questions about this product by Gouler, contact us by completing and submitting the form below. If you are looking for a specif part number, please include it with your message.